In October of 2013, we completed the Racial Equity Survey report of City Council Candidates in Iowa City. Each candidate was asked the following four questions. Click here for the full report in PDF format. 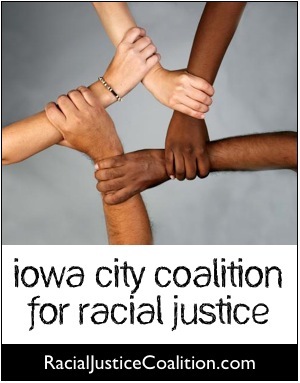 With regard to your city government’s staffing and policies, what would you say is the most important information or message contained in the Coalition for Racial Justice’s Report ― “Racial Equity in Iowa City and Johnson County”? What are your views about the relationship between the Iowa City Community School District and your city’s government, especially with regard to the District’s Diversity Policy and Facilities Master Plan and your city’s policies concerning housing and zoning? Do you think the District and your city’s government can and should collaborate to provide lower income residents with better access to quality education and housing, and, if so, how? Very few African-Americans or Hispanics are employed by city governments in the Johnson County area. What percent of your city government’s employees and elected officials are African-American or Hispanic? Do you think those percentages are just about right, or, if not, what do you think should be done to increase them? Housing markets are regional in scale, but city governments decide how land should be used within their city limits. Do you think Coralville should collaborate with other city governments to ensure that new housing for low-to-moderate income households is dispersed fairly throughout the Iowa City/Coralville region? Please explain your answer. In October of 2013, we completed the Racial Equity Survey report of City Council Candidates in Iowa City. Each candidate was asked the following five questions. Click here for the full report in PDF format. Very few African-Americans or Hispanics are employed by city governments in the Iowa City area. What percent of your city government’s employees or elected officials are African-American or Hispanic? Do you think those percentages are just about right, or, if not, what do you think should be done to increase them? Last spring the Ad Hoc Committee on Diversity Issues submitted its report and recommendations to the City Council, and the Council later approved the City Manager’s proposals about how to respond to those recommendations. Please state what you think of that report and the City Manager’s/Council’s response. The Forest View trailer court is located at the southwest corner of the intersection of I-80 and N. Dubuque Road. Many (if not most) of the residents are lower-income Hispanics. The man who owns most, if not all, of the property has described his general plans for redeveloping the trailer court. Redevelopment would require some kind of rezoning, might entail some public subsidies, and would require current residents of the trailer court to move. In general, how would you respond to such a redevelopment? Just a last reminder that the City Council will consider the recommendations put together by City staff in response to the Ad Hoc Diversity Committee’s Report TONIGHT. The work session is at 5 — where we can hear what Council members and staff think about things and the regular meeting — where decisions are made and the public can give input — starts at 7. We will gather at 6:30 (between the 2 meetings) to talk a little more about what points we want to make and see who all might like to speak. Just having your presence there is also very important so come even if you don’t want to speak. We will have Coalition badges for people to wear. The general consensus is the City Staff recommendations are another indication that they don’t understand the meaning of racial disparity and the importance of this issue for the whole community. And that they didn’t understand the real substance and perspective of the Ad Hoc Committee Report. Their response really is quite similar to the power point the police chief gave to us 2+ years ago — mostly outlining their accomplishments. So this is a crucial time for us to stand up and say there’s a problem in Iowa City and we need to learn about it and address it much differently than we have been. so do come and show your support!